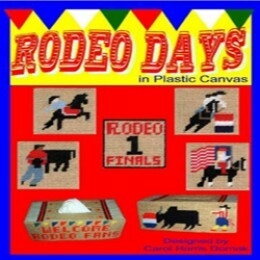 Get free plastic canvas patterns in rodeo themes. Original patterns by Dancing Cowgirl Design free to download, print and sew. I designed and made a rodeo out of plastic canvas. If you have read any of my other articles, you know that I have a deep love for all things western. One of my passions is crafting and I reference a lifetime of rodeo and western lifestyle when creating things. After I built a doll house out of plastic canvas, I had much better knowledge of how to construct a project on my own. So I decided that I would make some rodeo coasters and ended up with a rodeo arena and accessories for a table centerpiece. I hope you enjoy a look at what I have made and that you will try a few of the free plastic canvas patterns that I am releasing. All Photos And Patterns Are Owned By Dancing Cowgirl Design. How this got started was when I looked around for some western themed patterns and wasn't able to find what I wanted. I found some design software that would let me scan in my photo and it would convert it into a pattern. That was not the total solution though. I wanted my patterns to look as good as possible, so I did some tweaking to the patterns that I made with the software. With an eye for what it needed to look like, I felt like some stitches needed to be changed up a little. On other patterns I drew out a rough sketch onto the canvas with a magic marker and started an outline. I put stitches in, took them out and replaced them till I was happy with the finished project. The coasters came pretty easy once I got going. The design and construction of the arena took a bit of time and patience and was all done without the help of software. This arena is made totally from plastic canvas. It is large enough for standard placemats to fit inside. The bucking chutes on one end hold coasters and the opposite end near the announcers stand holds the blue jean pocket with napkin and silverware. I was thinking of salt and pepper shakers when I made covers to fit on mini spice jars that look like barrels used in the barrel racing event. A smaller barrel represents the one clowns use during the bull riding. That is for toothpicks. I wanted to show some of the construction that went into my project. These pictures show where I built the announcer stand and connected to the bucking chutes. Most pattern books are printed with symbols substituted for colors to be used in each space. I tried making some patterns that way and it was harder and very time consuming. You will find that my patterns will look like the example on the right with colored lines instead. Do you like steer wrestling or bull riding? Those or just two of the patterns I created using plastic canvas. The contestant back number coaster could be made in most any combination of colors. I have included some examples of different ways to get more out of these patterns. Change color of the animal. Change color of cowboys /cowgirls clothes. Sew a border around the edges.... or not. The pattern for this pocket is easy to make and it works well for holding a napkin and silverware. The pattern for the rodeo tissue box consist of two different side panels, one top panel and an end piece that you will need to make two of. I hope you enjoy these full size printable patterns.